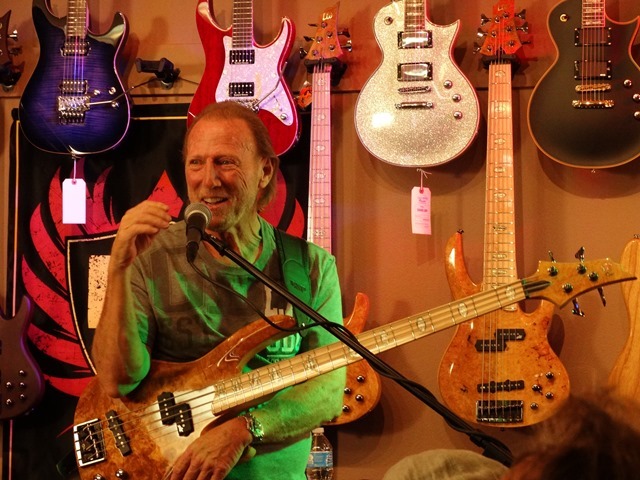 Last Friday, May 9, GoDPSMusic held a free, live in-store and streaming ESP clinic featuring Tower of Power bass legend Rocco Prestia. It was easily one of the coolest music events Newbury Park has ever seen. Upon arrival, Rocco’s ESP clinic was packed and several of the people in the back of the room ended up being very special guests. Sporting his beautiful 4 string ESP bass, Rocco played some bass lines and talked to the crowd. The entire audience hung onto every note he played and every word he said. It was a real thrill to be able to see him play his trademark finger style funk so close up. His bass playing is groovy. After jamming on the bass, did a candid Q&A with the crowd and talked about his bass and his playing. He answered question in a very matter-of-fact way with a good, dry sense of humor. When asked what it was like to play with David Garibaldi, he shrugged and said “Good” just like it was no big deal. When asked if he ever plays a 5 or 6 string, he shrugged and said, “Why would I do that?” It was pretty hilarious. Here’s a guy that has seen it all and done it all just being himself. 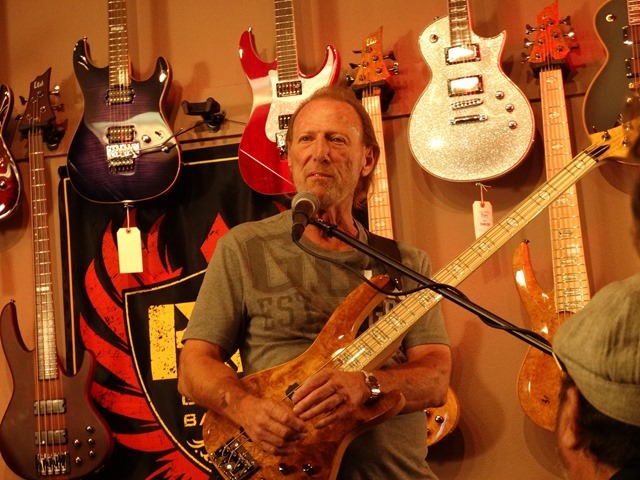 He also talked about his health (he seems to be doing pretty good) and stated that he’ll be making his return to Tower Of Power when things improve after his surgery. During Q&A, Rocco got a question in the crowd from Robert Trujillo (Metallica, Infectious Grooves) about the music scene in the Bay Area back in the day. 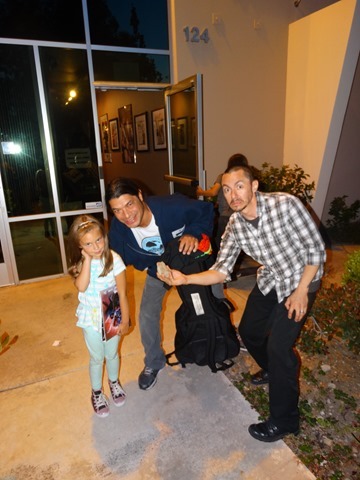 Also in attendance were PHILM and WAR’s Pancho Tomaselli (who happens to be Rocco’s nephew), Sal Rodriguez – the drummer for WAR since 1990, Billy Box and Sam Aliano, who has been touring with Tony MacAlpine. Pancho and Robert both just recently participated in an incredible event that paid tribute to The Who’s John Entwistle and Keith Moon. Drummer Sam Aliano has a great gig going on tour with the incredible Tony MacAlpine and his band. He said he’ll be performing with CAB soon. Towards the end of the clinic, Sammy got up and joined Rocco for a funky bass and drum jam. Watching them lock in was a lot of fun. Sam is a respected clinician and has been a local drum instructor for quite some time. He has taught and performed with many big names in music. A few years back, he rocked with an all star group at a very cool benefit show at The Canyon Club that had students performing with many famous musicians, such as Bruce Kulick, Rudy Sarzo and Thomas Lang. That was a great show with lots of talent. And so was this one. 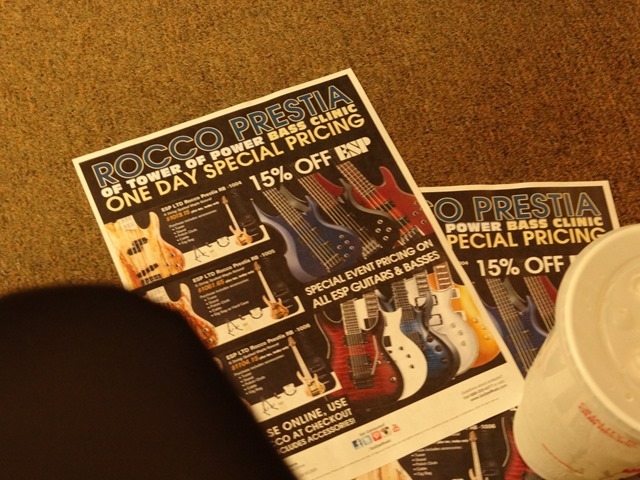 After the jam, there were informal meet and greets throughout the store and Rocco signed autographs and took pictures with fans. All the guys there were very encouraging to the kids that were there to watch the clinic. And there were ESP free hats and water bottles on the way out. Everyone left a winner. Score! Rocco was a HUGE influence on Jaco Pastorius. Here’s the trailer for Robert’s upcoming documentary on Jaco, which made his being there even more special.